From the 1983 LEOMA DIAMANT produces and plans superabrasives tools in Diamond and CBN (Borazon®) electroplated and resin bond for the mechanical industry of precision, aerospace, automotive, nautical, for the composites and similar processing, plastic reinforced and glass-reinforced plastics processing and stone processing too. 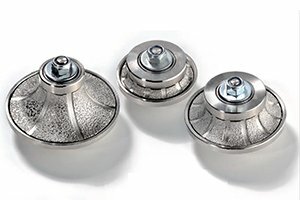 We also have a large range of standards tools in ready delivery (grinding wheels and shaped tools on shank 3 mm and 6 mm, files, cutting discs, hole saws) and realize in short times special tools on your design or we plan them based on your requirements. We can also replate used tools and restore them to as close to the original specifications as is possible. 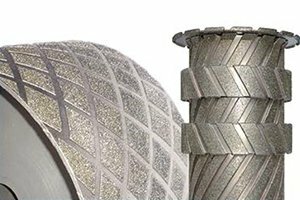 With our flexible manufacturing platform we can produce the widest variety of styles and sizes to meet your abrasive tooling needs, from small diameter 0,5/1 mm up to big diameter of 1000 mm. With new technology AVT (Advanced Vacuum Technology) we can realize exceptional performances tools for the varied applications. The assignment of “superabrasives” derives from the fact that their hardness is significantly higher than all other conventional abrasives, such as corundum, carbide silicon, etc. The Diamond has hardness 10 in the Mohs scale, the CBN is slightly lower. In the scale of “Knoop hardness”, the Diamond has over 8500 Kg/mm2, the CBN more than 4500 Kg/mm2. There are different types of Diamond: when it’s naturally occurring, it’s called “natural Diamond”. Other different varieties are produced industrially, and called “synthetic Diamond”.The CBN does not exist in nature: it’s only produced industrially. The production consist to apply very high pressures at high temperatures to pure carbon, which then turns into Diamond,or to nitrogen and Boro, which are transformed in cubic boronnitride. 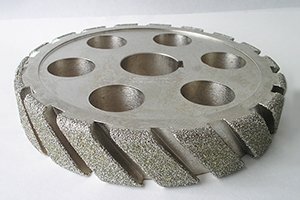 The different sintering conditions applied canproduce superabrasives with different characteristics about cutting and friability. 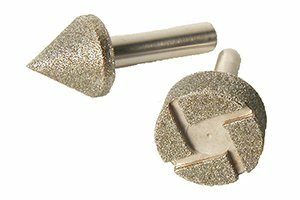 Electroplated tools consist in a single layer of superabrasives grains (Diamond or CBN) fixed on the blank by a nickel galvanic process. The thickness of the layer of nickel depending by the thickness of the grain so that it projects for about half its diameter. The individual grains are firmly held, but partially exposed respect to the tool surface, so it’s very aggressive and has ample space for the discharge of the ‘chip’. The profile of the electroplated tools is totally covered by a single layer of superabrasives grains. For these is not possible to perform operations dressing and/or correction, but is possible create tools with complex profile. The worn tools can be regenerated with a process that allows removal of superabrasives without alteration of the support steel. This is especially convenient in the case of complex or big dimensions tools. Filling adhesives, adhesives with fibres, putties with fibres for general bonding of FRP parts, filling edges and small medium curves, repairing of damaged surfaces. We manufacture special tools designed by the customer (size max. diam. 1000 mm). For complex or expensive tools, or in any case in which there is convenience for the customer, we remove the worn diamond and make the subsequent coating without damaging the substrate (or replating regeneration). Our technical staff is at your disposal to study and develop special tools to fit your specific needs.